This quilt has been in the works for so long. I think I first posted a photo to Instagram in February! The quilt is made of all Denyse Schmidt scraps and Michael Miller Cotton Couture in Indigo as the background. The pattern is my own design. It's just a simple window panes block and then a solid square, all set on point. Each square finishes at 5.5". 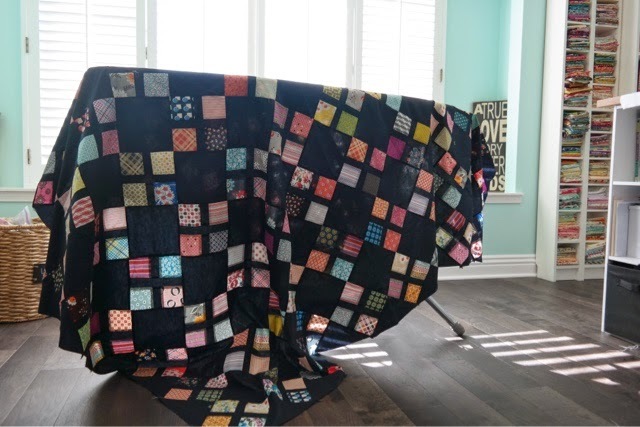 The quilt has been finished for a few months and I have been waiting for the right photo opportunity to finally blog about it. We went to one of our favorite cafes for breakfast this morning. I am so glad I took the quilt with me. I actually photographed two quilts today, but I'll save the other one for a future post. So here is my Windows quilt. I am so pleased with the way it turned out. I am also happy about making a huge dent in my Denyse Schmidt fabric scraps. It is such a satisfying feeling to use up smaller pieces of fabric and make them into something so pretty. This quilt will be gifted later in the week, but I kind of hate to part with it. 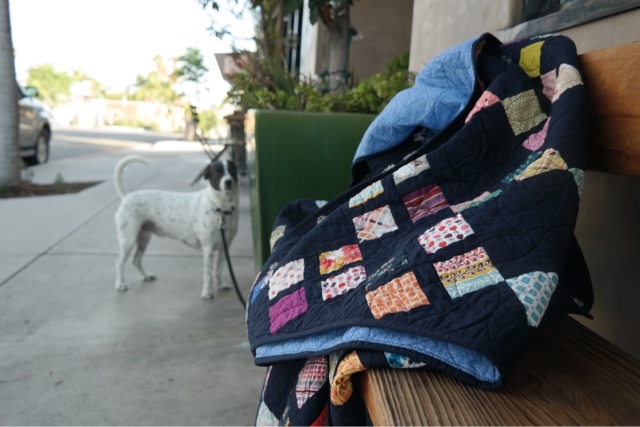 Sarah, CrinkleLove, quilted this for me. I chose the orange peel pattern and it shows up nicely on the backing and adds a great crinkle to the front of the quilt. I used the zigzag binding method and bound it with the indigo solid fabric, so as not to take away from the colorful window blocks. This little dog sure was curious. Backing: Widescreen by Carolyn Friedlander, color Pacific. 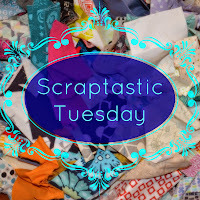 Linking up with Nicky and Leanne at Scraptastic Tuesday. This quilt is really lovely. The pattern is interesting and simple at the same time. I can totally understand why you don't want to give it away! Maybe you will have visiting rights? And to only have a quilt 'in progress' for six months is not a long time Di! Not in my book anyway! Great finish! Such a lovely quilt Diane! And the sweater from the last post us adorable. You are so talented! Wow, that's a really gorgeous quilt. I'm not usually a fan of colours and black, but these ones look great....not gaudy at all. Love the layout too, and your photo shoot. Very beautiful quilt and I'd have a hard time parting with it too. Bravo on the finish!!! Wow this is so pretty! Love the dark! 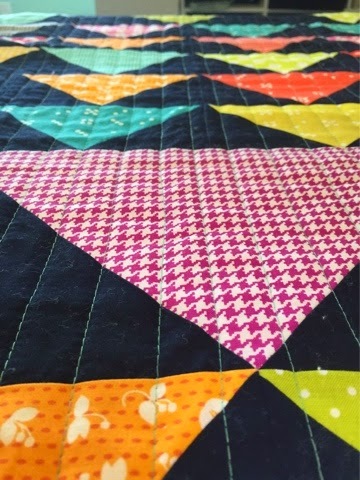 Wow - this quilt is gorgeous!! So striking, the design really brings out the colours and the prints.